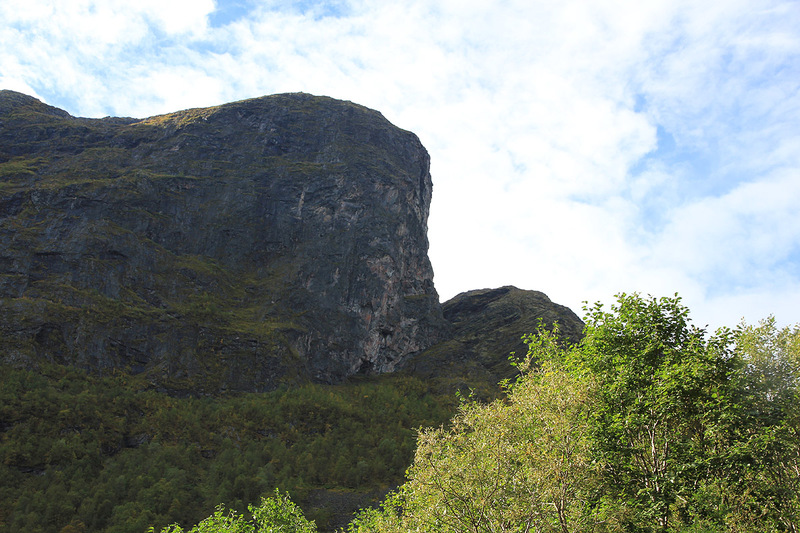 This mountain is best accessed from Lærdal. A good point of reference is the traffic circle as you exit the 25 km tunnel on E-16 (from Aurland to Lærdal). Measure from this point. Continue on E-16, direction Oslo, for about 4.7 kilometer. There should be a Joker (grocery) store on your left. Make a right here (leaving E-16). Cross the bridge and make a left at kilometer 5.0. At kilometer 8.7, cross a small bridge (after a left curve), then follow the main road as it turns right. At kilometer 9.0, the pavement ends and the road continues as a good dirt road. At kilometer 16.1 you cross the river on a bridge, continue to kilometer 16.4 and park here. There is parking for one car on the right hand side, while at least two cars can use the turnout on the left hand side of the road. This is the trailhead, location N60:59.660, E007:39.758, elevation 550 meter. The trail starts right up the hill from the road. There is a small wooden sign saying Vindhella. The trail runs uphill, fairly steep in the beginning, on the right side of the creek. Higher up, as you approach the area called Vindhella, the valley opens up and becomes quite flat with good gras (for sheep?). Continue in the valley, the trail is small, but not too hard to follow (a few more hikers would be helpful!). Eventually, you get to a boulder field that extends all the way down to the creek. The trail sort of fades out here. On the opposite side, there are many indications that the route climbs the grassy slope, then traverses higher up just below a cliff band. 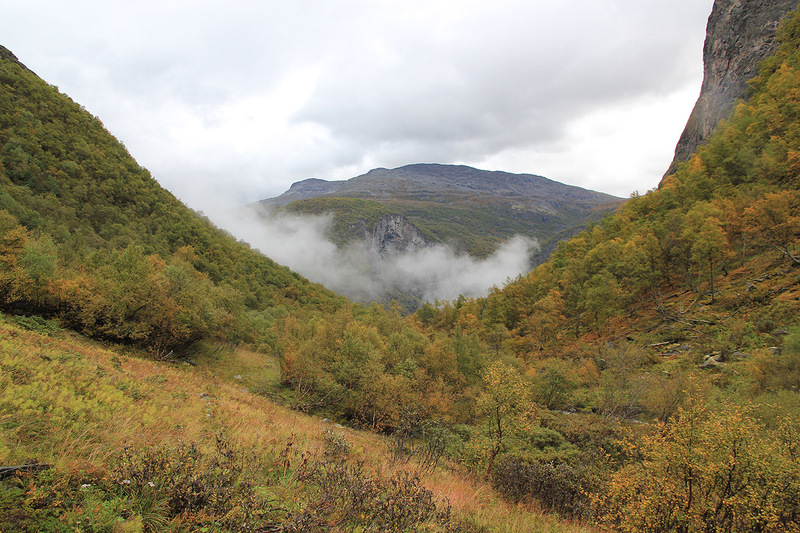 At least, there is a trail up there and it runs nicely below some overhanging cliffs than contours around right and gains a nice slope just east of Hadletjørni. Thus, I did not follow the trail as marked on the map, however, this may be better (if there is a trail? 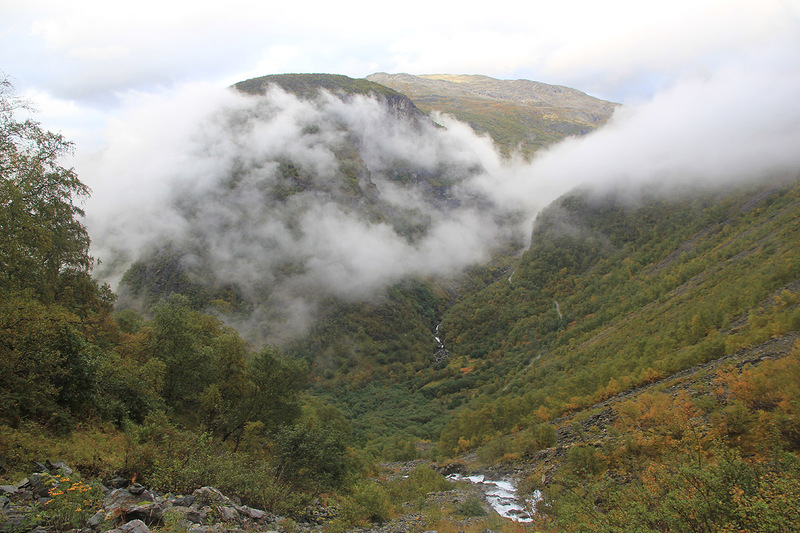 ), as the grassy slope is quite cumbersome, perhaps in particular when wet (as it was when I climbed it). 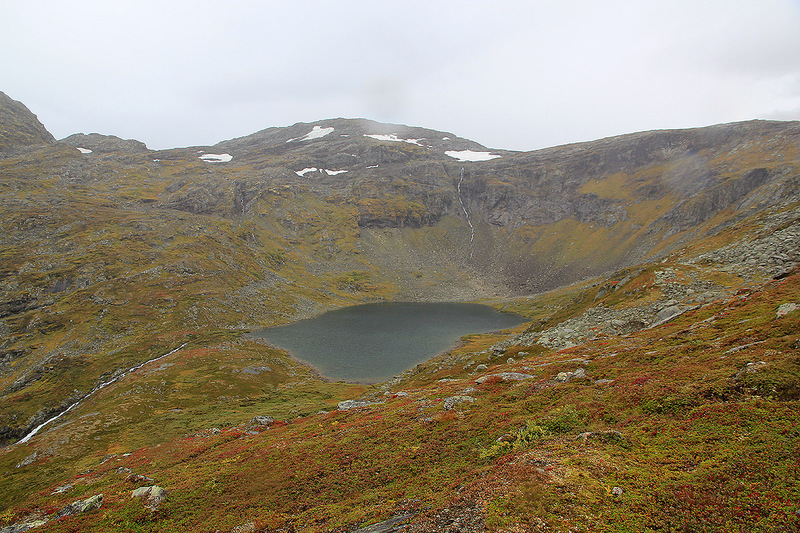 Ascend the slope (NW) east of Hadletjørni, cross close to the small lake that is located north of point 1452, then continue west, perhaps slightly right of the snow that may be visible in the east side of Hånosi. Gradually, turn north, the slope is quite easy and the footing is good. Higher up, traverse right in order to avoid getting into scrambling terrain. A good waypoint is N60:58.787, E007:35.152, elevation about 1725 meter. From here, continue straight to the summit, some 350 meter away. 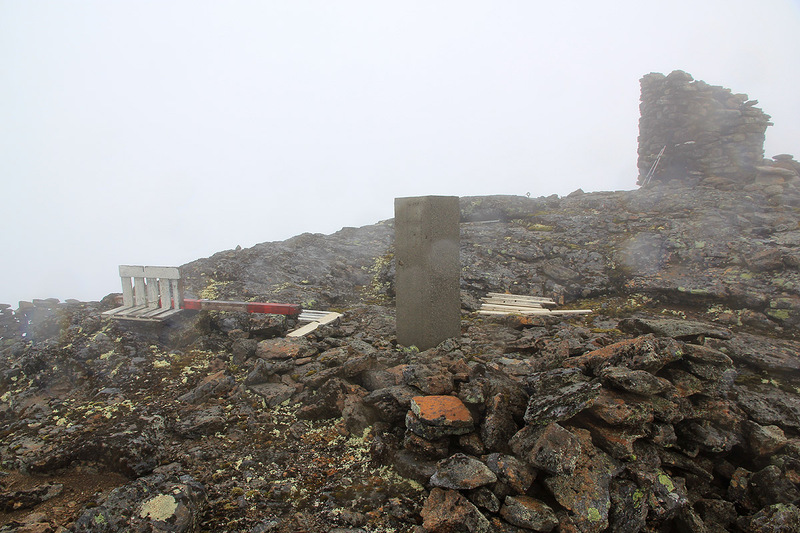 There is a large cairn that is slightly collapsed on one side. Somebody has also made a concrete marker nearby. 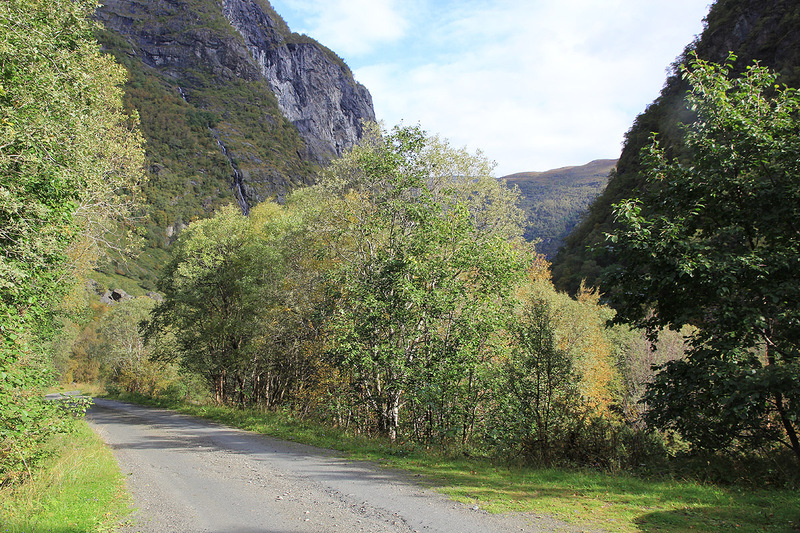 Note: There is an alternative route that starts near the farm Rikheim, (also from the farm Øvre Rå) in the main valley and proceeds up Senddalen. This route has a bit more vertical gain, but possibly a nicer and more direct trail. 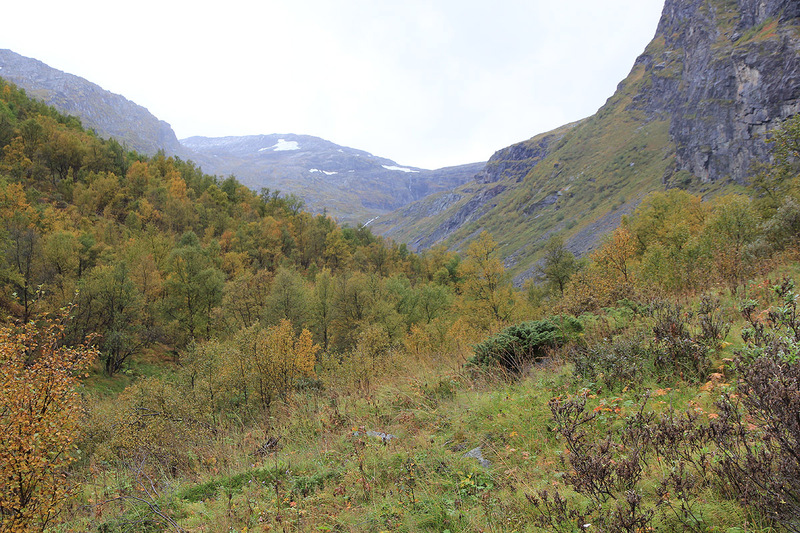 The weather outlook was not too good, but I wanted to have a good September hike in the mountains. (I always used to go hunting ptarmigans with my father around mid September.) I had planned to ski this mountain from the road that connects Aurland with Lærdal, the one that runs across (not through) the mountains. However, this road does not open until June and by then I am normally busy with other projects. 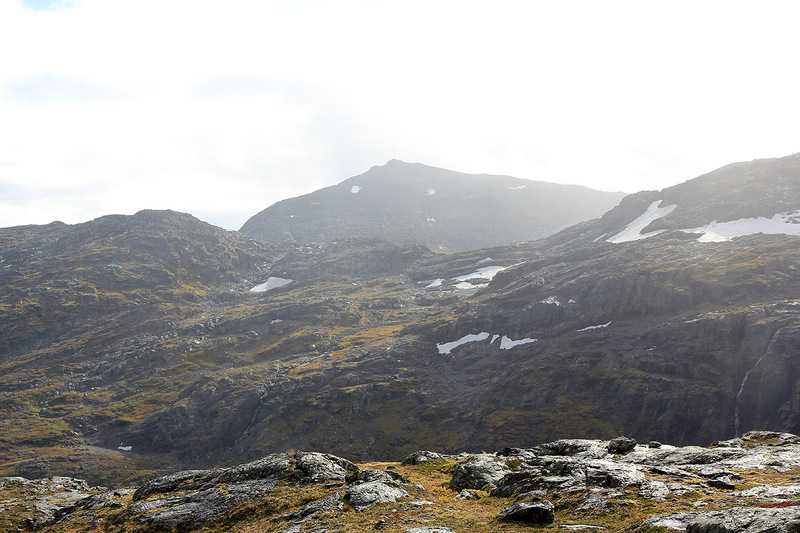 I left Bergen at 0800 and was ready to hike by 1100. The trail was wet, but it did not rain. Awfully slippery, but it was nice to be out. I had more than 1200 vertical meter to climb ahead of me. The valley became flat higher up, quite a nice valley. 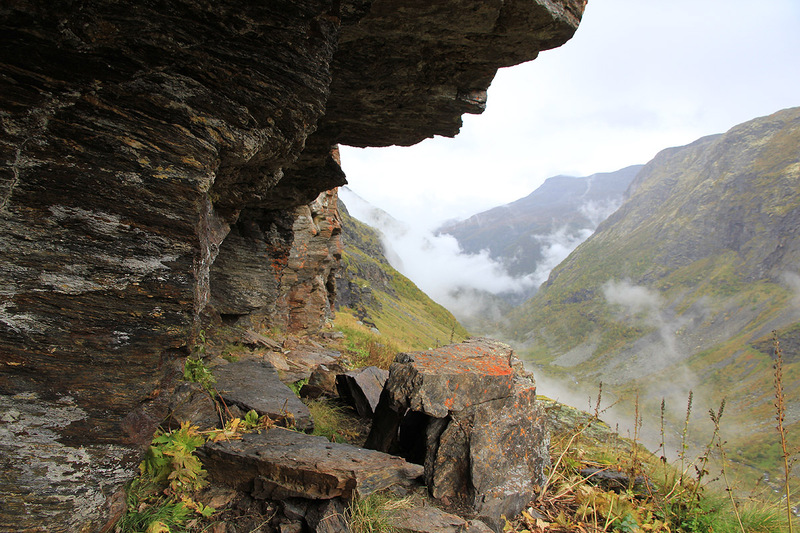 I climbed right up a steepish and slippery grassy slope and found a trail higher up that contoured around below and above a set of steep cliffs. 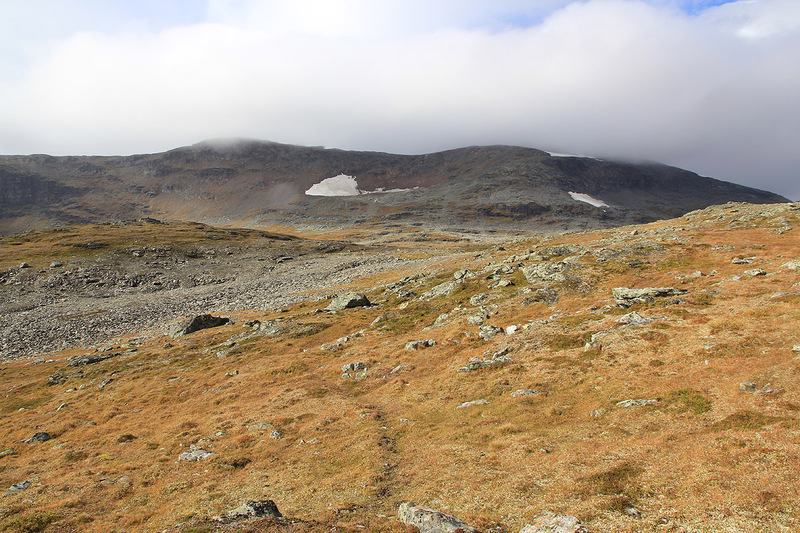 The route went well and soon I was crossing the very nice landscape at the base of Store Hånosi. There were some sheep up here, I wonder if they are lost, in any event it may be high time to get them down, it could snow at any time now at this elevation. The route up to the summit was very nice walking, I had feared slippery boulders. 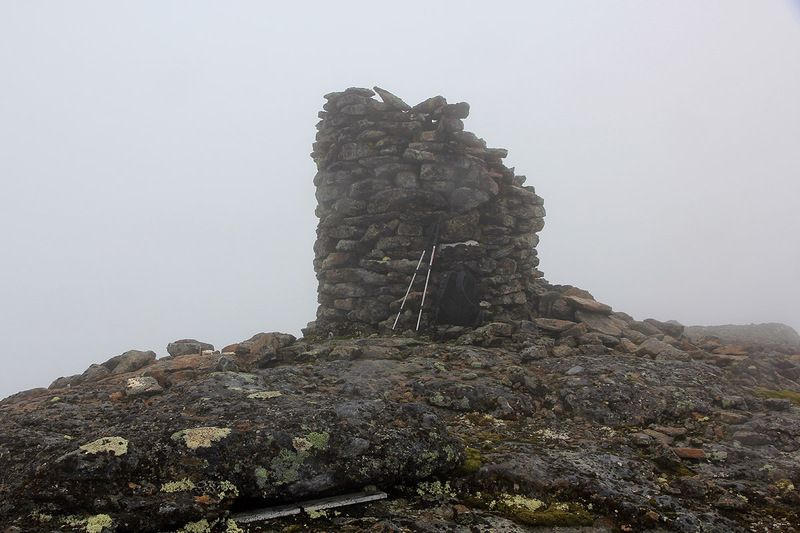 I arrived at the summit at 1420, a cloud had settled and the place was completely fogged in. I had a chocolate, then returned at 1430. The return hike had more rain, but nothing really bad. I ended up traversing left one level too high and found myself above the cliffs I had traversed below when ascending. A bit tricky due to the rain and very slippery conditions, I navigated rather carefully in order to reach the grassy slope below. 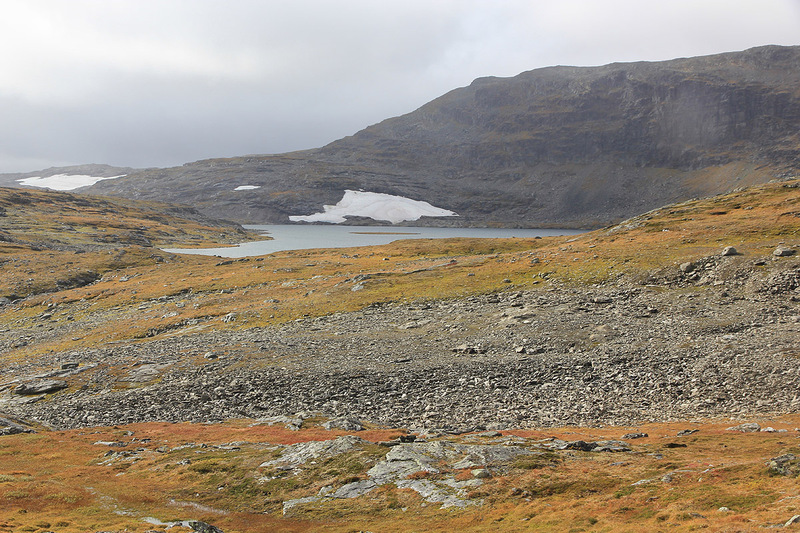 I was back at the car by 1720, back at Nattlandsfjellet by 2030, then down to the city where Heidi had a nice reindeer stew waiting. Indeed, a very good day. 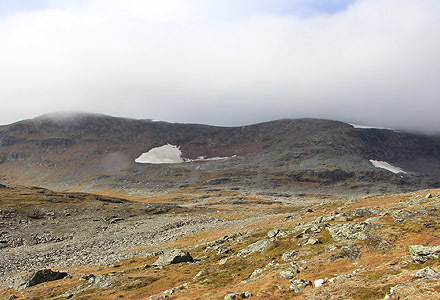 Hånosi, the summit is hidden in the clouds on the right side. The trailhead, looking down the road. 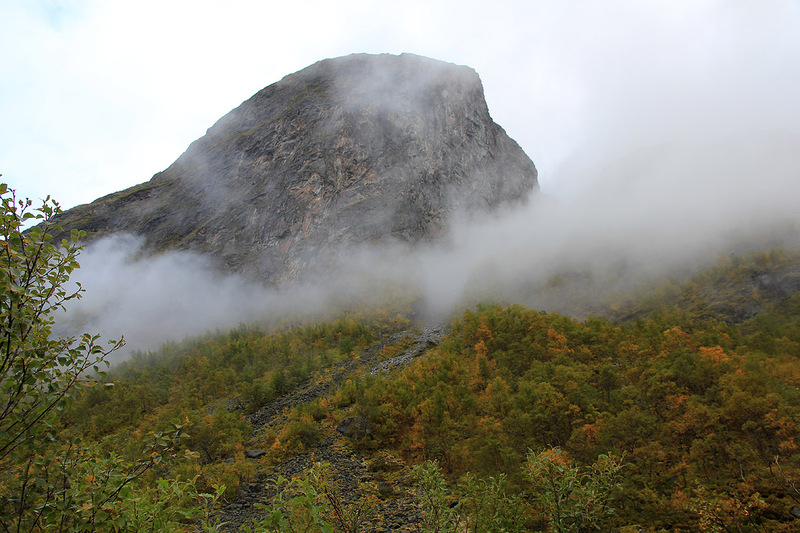 Part of Skruven, this cliff catches your eye. Looking back, where the valley levels off. 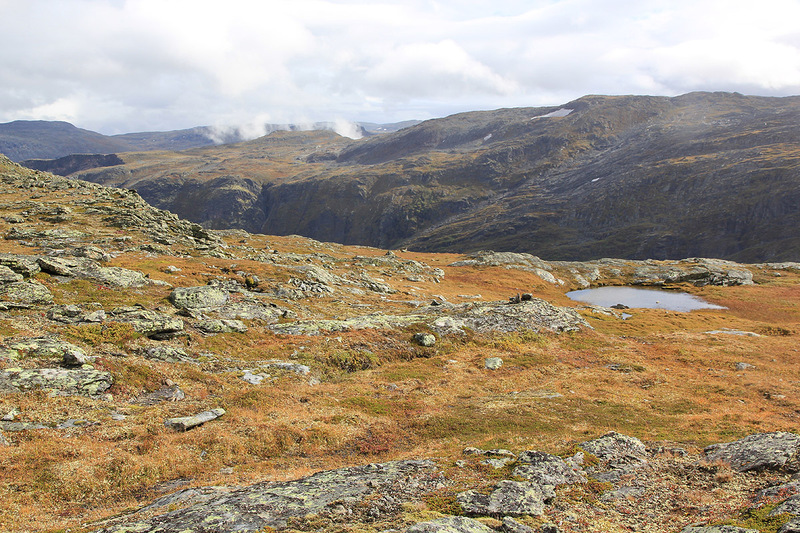 Håstarren, 1720m, as seen from the slope above Hadletjørni. Looking back, from the top of the hill above Hadletjørni. Skruven, as seen when descending. Valley view, looking across the trailhead when descending.